- Endless fun through online matches including rankings! 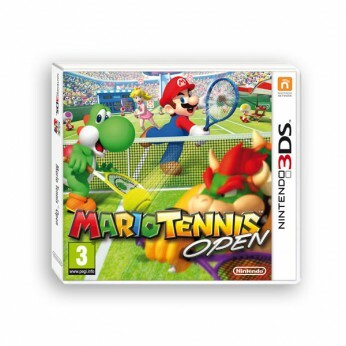 Mario Tennis Open is an upcoming sports title for the Nintendo 3DS – it is the richest Mario Tennis game ever! Suitable for the Nintendo 3DS: In Mario Tennis Open on Nintendo 3DS, the basic controls are similar to previous titles in the series, but with the addition of gyro sensor and Touch Screen controls – made possible thanks to Nintendo 3DS – you can enjoy tactical tennis with greater depth than ever before. Endless fun through online matches – including rankings. Fully customisable Mii characters. Download play on a single cartridge. WiFi online play and European rankings. Lots of mini-games. Motion controls. Hold the 3DS vertically and then bounce the ball back depending on your direction. Via streetpass you can get Nintendo-themed costumes for your Mii characters. For ages 3 years and over; EAN/MPN/UPC/ISBN: 0045496521974. This toy costs approximately £31.99 (for the latest and best prices make sure you check our retailer list for the Mario Tennis Open 3DS above). In our review of Mario Tennis Open 3DS we classed it as being suitable for ages 4 years, 5 years, 6 years, 7 years, 8 years, 9 years, over 10 years, Teenagers but recommend you check the manufacturer specific advice before purchasing.